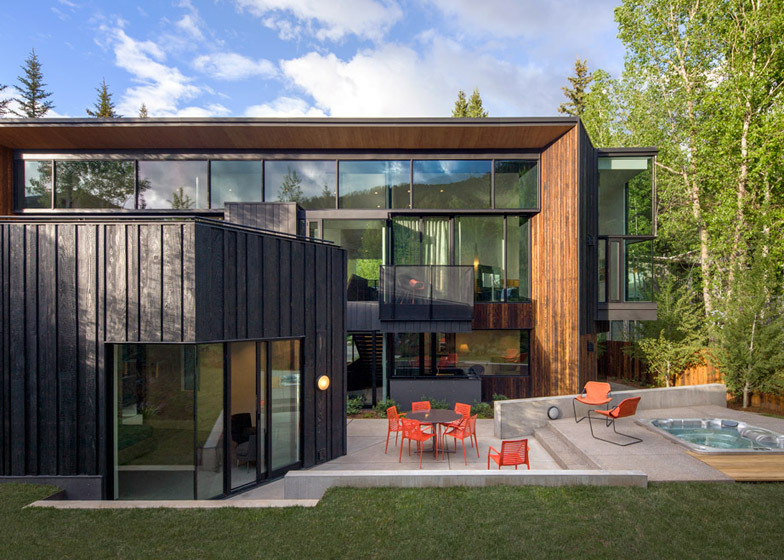 This family dwelling in the Colorado mountains by Will Bruder Architects features an exterior made of burnt wood and a roof sheathed in copper (+ slideshow). 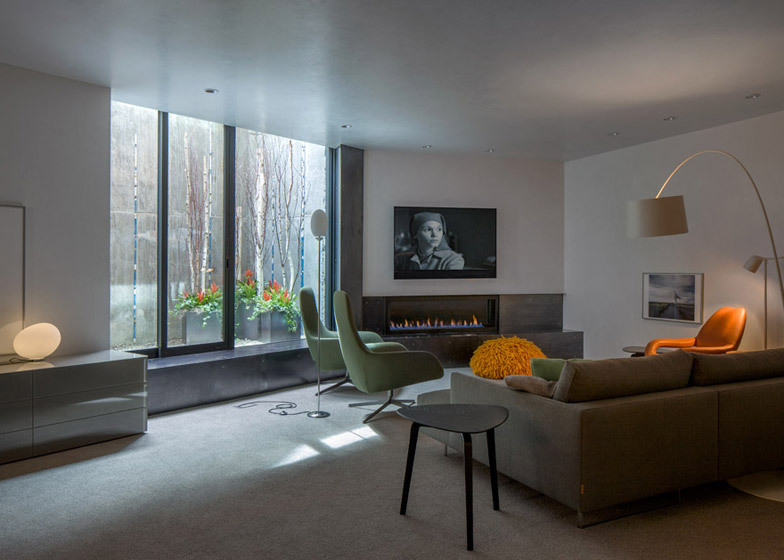 Encompassing 5,830 square feet (541 square metres), Blackbird House is located three blocks away from the main ski lift in downtown Aspen. It is situated on a 850-square-metre property in a small cul de sac, in a neighbourhood characterised by mid-century Modern homes that are relatively modest in size. Wedged into a gently sloped site, the home contains three levels and is trapezoidal in plan. The design is a "creative response" to the town's form-based zoning codes – regulations that are based on a building's physical appearance rather than its use. 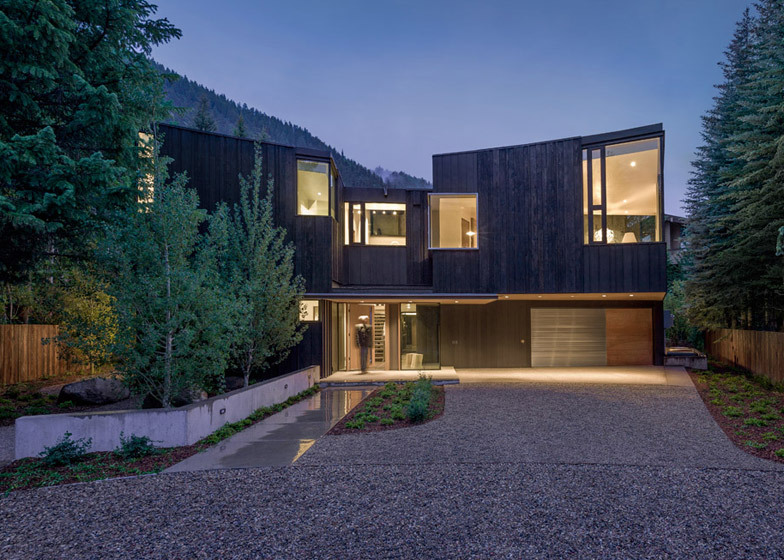 "The height is sensitively responsive to the town of Aspen's desire to maintain a comfortable small-town human scale," said Will Bruder Architects. "While generous, the project respects a building scale complimentary to the community's historic fabric of wood-sided, one-bedroom miner's cabins and delicately detailed 19th-century Victorian homes." The dwelling is clad in torched cypress – an effect known as shou-sugi-ban – and pre-weathered zinc, and is topped with a copper roof. The house is oriented to provide sweeping views of the forested landscape and nearby mountains. 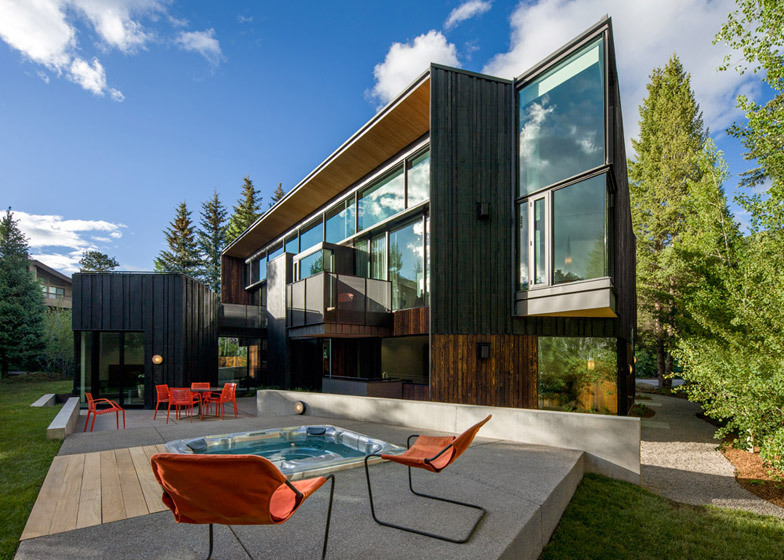 "Generous window apertures are placed to capture the surrounding views while the architecture visually recedes into the shadows of the aspen and conifer trees that surround it," said the firm. 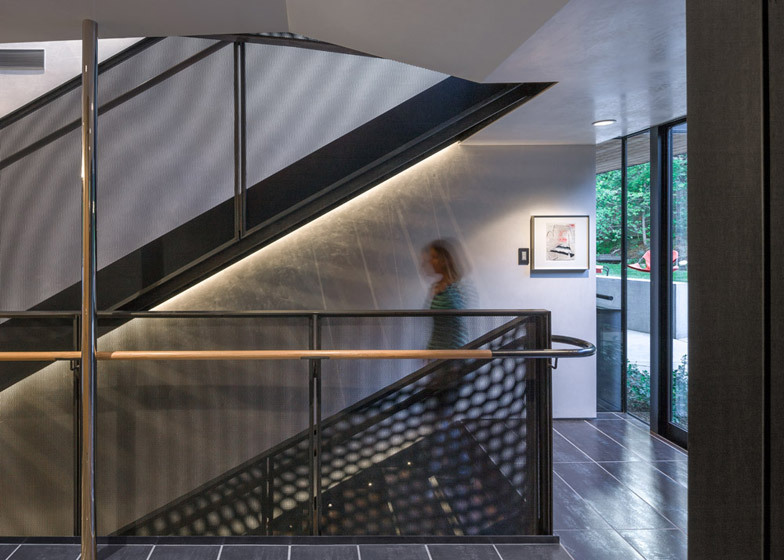 Inside the home, the ground level features a central stairway constructed of blackened steel and lit from above by a skylight. This storey contains two bedrooms, along with a glass corridor that leads to a semi-detached guesthouse with a bedroom and bathroom. The top floor features the living room, dining room and kitchen, along with the master bedroom suite. High ceilings are composed of folded planes that follow the form of the butterfly roof. The home's lowest level, which is below-grade, is lined with lightwells on the west side. This floor features a generously sized bedroom, a room for flexible use and a wine cellar. Throughout the home, interior finishes include white troweled-plaster walls and ceilings, doors and cabinets made of rift-sawn white oak, and walnut floors. 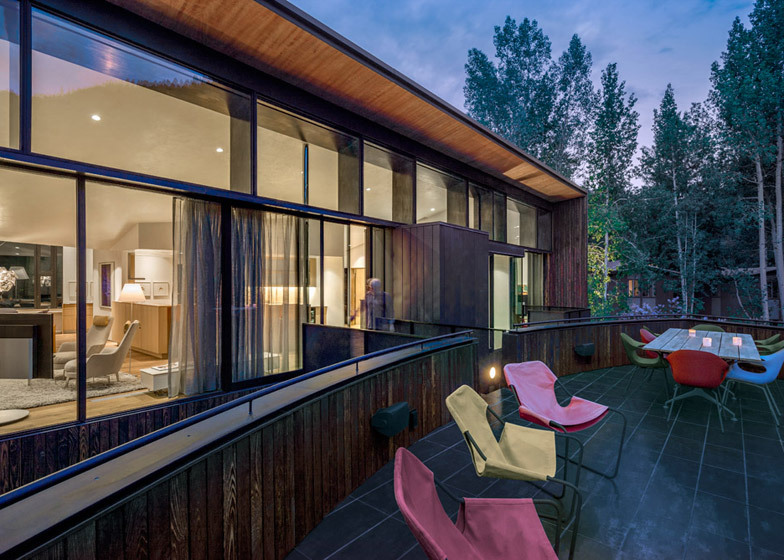 "The architecture is designed to be a 'rustically' refined backdrop for a sophisticated, indoor/outdoor contemporary lifestyle, where all of one's senses are engaged and enhanced throughout the seasons of Aspen," said the firm. 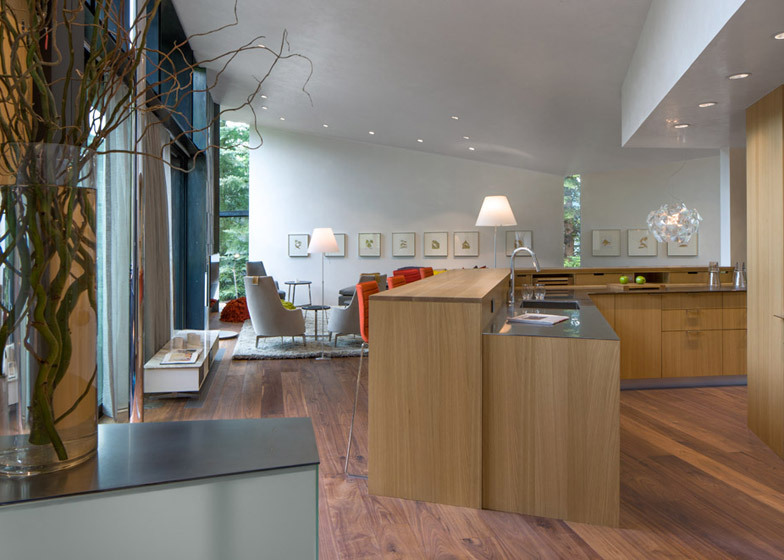 The home was designed for a developer friend who quickly sold it upon completion. "The house sold in four days to a family of five from New York City, with the intention of using it as a mountain retreat," said the architect. 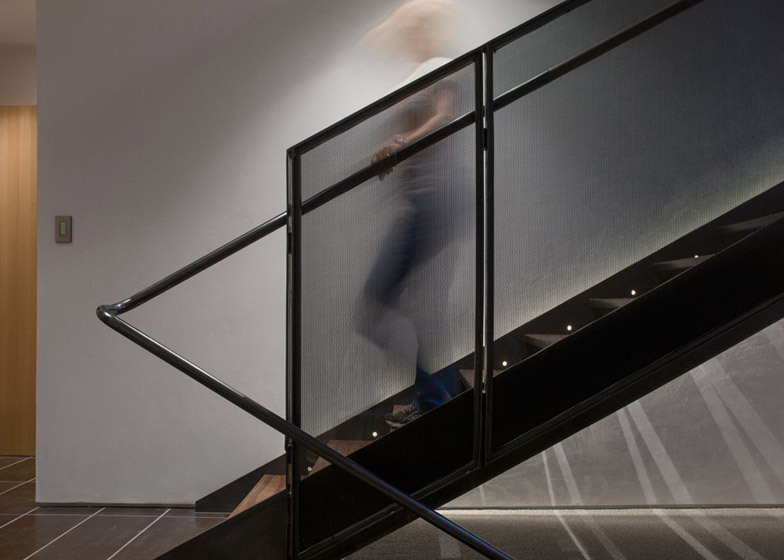 Based in Phoenix, Will Bruder Architects is among the most well-known firms in the American Southwest, alongside Rick Joy Architects, Wendell Burnette Architects and others. Other projects in Colorado include the Shigeru Ban-designed Aspen Art Museum, which opened last year, and a proposed Olympic Museum by Diller Scofido + Renfro that would be built in Colorado Springs. Photography is by Bill Timmerman.